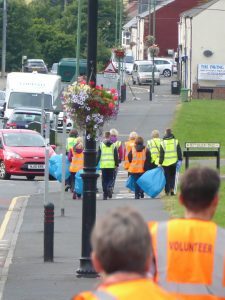 Programme of volunteer litter picks for 2017 announced. are looking for volunteers to help. Please come and help. a couple of hours of your time can make a big difference. Find out more in the Keep Coxhoe Clean section of our website. Do you look after someone who may be unwell or disabled? If the answer is yes, you could be a Carer. You might be helping someone with their personal care or be offering them practical and emotional support or just ensuring that they are safe and coping. As a result you might feel isolated, overwhelmed and undervalued. Durham Carer Support can offer specialist advice and information, practical help with completing forms, gaining benefits, grants and other funding. We can also help Carers that are in need of a break. Residents are to have their say on police funding. The bottom line is the government is giving the Police less cash so Durham Police are asking the general public to pay more. 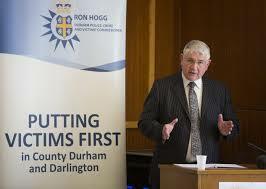 Durham’s Police, Crime and Victims’ Commissioner Ron Hogg is seeking views from members of the community as part of his annual public consultation on the police budget. To help address further cuts to police funding, Ron intends to increase the amount of Council Tax which goes to the police service, known as the precept, by 1.98%. This equates to just £2.20 over the year, or 4p a week, for a property in Council Tax Band A.
Ron Hogg said: “In the 2015 Comprehensive Spending Review (CSR), the Government stated that they will protect the overall policing budget.”Ministers have chosen to allocate some of this money to national priorities like counter-terrorism, but they have also cut the money available for local policing in order to fund organisations like the Independent Police Complaints Commission. Furthermore, they have increased the amount of police money which we can only get back if we bid for it. or by telephone on: 0191 375 2001. Do you shop at the local Coop? Are you a Co-op member? If so, did you know that you can help provide funding for our village community facilities every time you buy Co-op products? 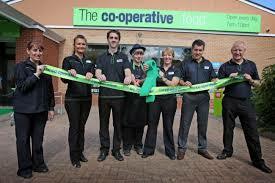 As a member, every time you shop at the Co-op, 1% of what you spend on Co-op brand products and services goes to the Co-op Local Community Fund. If you sign up to one of our local community causes such as Coxhoe Village Hall or the Active Life Centre then the fund is donated to the cause that you sign up to. Coxhoe residents have already raised some £1,200 this year in contributions to the Village Hall and the Active Life Centre. If you are not signed up already all you have to do is go to to the Co-op website on the link below, click on the link under ‘Select your cause’ and follow the instructions. Please help, the more people who sign up and shop, the more the Coop donates. Check out the Co-op Local Community Fund on their website here. Coxhoe Parish Council hope you had a fantastic Christmas period. Please note that our offices remain closed until the beginning of January. Production of County Durham Plan to be paused, again! Durham County Council is to pause production of the County Durham Plan, a major planning document once more. 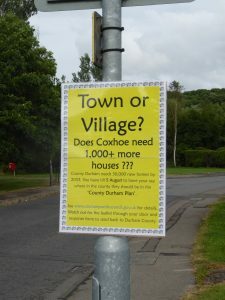 The last time this happened Coxhoe lost out when a major housing development at Parkhill was approved outside the unitary plan. While the likely impact of this further delay is not known it could allow our communities more time to work on a Neighbourhood Plan and help shape our villages’ futures. Further information is available on the County Council website or consultation portal. Find out more about Neighbourhood Planning here. Full colour copies of the December editions of the Coxhoe and Coxhoe Chronicles are now available online. Paper copies of the Chronicle will be delivered to all households by volunteers in the coming weeks. This edition has also been printed in full colour as a pilot and the Parish Council are keen to find out what you think about it. Lisa Caine, our new part-time Community Engagement Officer says, ‘ We want to get better at communicating with our community and the Chronicle is one of the ways we do so. We would like to hear your views about the Chronicle in general and about the colour version in particular so we can plan for future editions of this valued community newsletter’. A community group that runs weekly from Coxhoe Village Hall is participating in an international arts project. Coxhoe Quilters Group has joined up with The Barefoot Heart’s 70273 Project. The project was commenced in the United States by an individual called Jeanne Hewell-Chambers to commemorate one of the atrocities of the Nazi’s in the Second World War. Between January 1940 and August 1941 (before the Holocaust began), 70,273 physically and mentally disabled people – men, women, teens, boys, and girls – were murdered by the Nazis. Though they never even laid eyes on the disabled person they were evaluating, Nazi doctors read the medical files and, if from the words on the page, the person was deemed “unfit” or an “economic burden on society”, the doctor placed a red X at the bottom of the form. Three doctors were to read each medical file, and when two of them made a red X on the page, the disabled person’s fate was sealed. Most were murdered within 1-2 hours. The project of Jeanne Hewell-Chambers commemorate these 70,273 voiceless, powerless people who were so callously and casually murdered by gathering 70,273 blocks of white fabric (representing innocence and the paper the doctors read), each bearing two red X’s (representing one person), and which will be stitched them together into quilts. This was a massive task for one individual but contributions to the project are being sent to Jeanne from over the world. 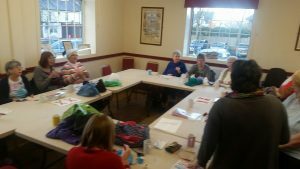 Coxhoe Quilters meet at the Village Hall every Friday morning between 10am and 12 noon. They have set themselves a target of producing 50 of the fabric blocks. At time of publishing they had produced 23 and on their way to their target. Can you help? If you can call in to the Quilters Friday morning craft sessions. There is a consultation on the STP which runs till towards the end of January. You can find out more here.